Photograph of the ceiling of the hall of the Mahadeva Temple at Ittagi, taken by Henry Cousens in the 1880s. The Mahadeva Temple dates from 1112 and consists of a sanctuary, an inner closed hall and an outer open hall all of which are very delicately ornamented. The tower over the sanctuary rises three storeys and the centre of each storey is decorated with little cusped niches. The outer walls are divided into pilastered projections and in the middle of each side of the sanctuary and mandapa or hall there are niches covered by miniature temple towers. The temple's exterior is decorated with foliation and monster masks forming a repetitive design on both the tower and the outside of the sanctuary. Above the doorway is a depiction of Shiva dancing. 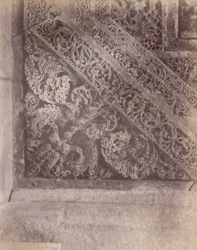 This view shows a corner of the ceiling of the closed hall at its junction with the wall, with a small piece of ornately-carved foliage.